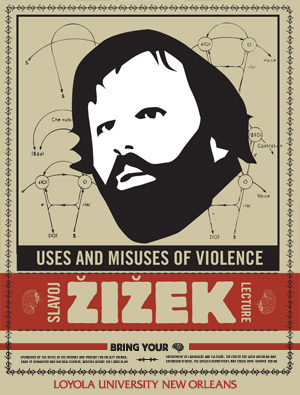 Charismatic philosopher and professor Slavoj Zizek will visit Loyola University New Orleans to present a lecture, "Uses and Misuses of Violence," on Tuesday, Nov. 17 at 7:30 p.m. in Nunemaker Auditorium, located in Monroe Hall. Born in 1949 in Ljubljana, Slovenia, Zizek was heavily influenced by Karl Marx, Georg Wilhelm Friedrich Hegel, Friedrich Wilhelm Joseph von Schelling and Jacques Lacan. In many of his presentations today, Zizek uses the psychoanalytic theories of Lacan to explain popular culture and popular culture to explain the theories of Lacan. In his home country of Slovenia, Zizek is viewed as a revolutionary. He was politically active in during the 1980s and a candidate for the presidency of the Republic of Slovenia in 1990. Zizek is the author of more than 50 books covering an array of subjects ranging from Hitchcock to Wagner, religion to cyberspace and Lenin to the Iraq War. He is the subject of several documentaries including “Zizek!” and “Slavoj Zizek: The Reality of the Virtual.” Most recently, Zizek collaborated with filmmaker Sophie Fiennes on “The Pervert's Guide to Cinema,” a film that offers an introduction to Zizek's ideas on subjectivity, sexuality and the relationship between fantasy and reality. Zizek has held positions at universities around the world including Duke, Columbia, Princeton, Georgetown, and the New School for Social Research in New York. Aside from maintaining a tireless global lecturing schedule, he is a professor in the philosophy department at the University of Ljubljana and is co-director of the International Centre for Humanities at Birkbeck College, University of London. This lecture is sponsored by Loyola’s Office of the Provost, College of Humanities and Natural Sciences, Department of Languages and Cultures, the Center for Latin American and Caribbean Studies and the English department. For more information, contact Josefa Salmon, professor of languages and cultures, at salmon@loyno.edu or John Clark, professor of philosophy at clark@loyno.edu.